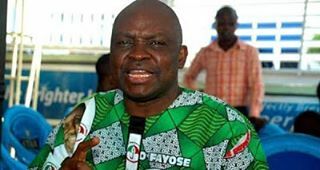 Fayose evicts Federal agencies from the housing estate he built. Gov. Fayose of Ekiti state on Wednesday evicted the Nigeria Security and Civil Defence Corps, (NSCDC) Ekiti State command and other Federal ministries and agencies from their various offices. They were evicted from Fayose Housing Estate, located along Afao Ekiti Road in Ado Ekiti, the state capital. The estate, which housed federal establishments such as NSCDC, Prisons Service, NAFDAC, NOA, NABTEB and others, was built by Fayose during his first term in office as a governor of the state and was named after him. The Public Relations Officer of NSCDC, Ekiti state command, Tolu Afolabi confirmed the development to newsmen in Ado Ekiti. According to him, the state government had earlier given a year grace to all the ministries and agencies to look elsewhere for accommodation or buy the property as the state could no longer give out its property free of charge in view of the biting economic situation in the country. “The period of grace ended on the 31st of December, 2016 after which a letter of eviction was served on the occupants of the estate. The letter said failure to quit the property would result being dragged to a rent tribunal. With this development, NSCDC officers in the state have been trying to cope with the situation and we are urging well meaning Nigerians to assist the Corps. It should also be noted, however, that not only Civil Defence was evicted by the State Housing Corporation from the property as being peddled in some quarters but all the federal agencies in the estate”, he said.